I was super excited to move into this apartment because we’re planning on sticking around here for a while. Since we moved in, we’ve slowly been adding furniture to the apartment. All but one piece of the furniture in our house is from one of three places: Goodwill, generous friends and family, or the dumpster, believe it or not. (Such is the life of a seminary couple) I LOVE it. I like looking around my house and thinking of the adventures my furniture must have been on before it came to me. 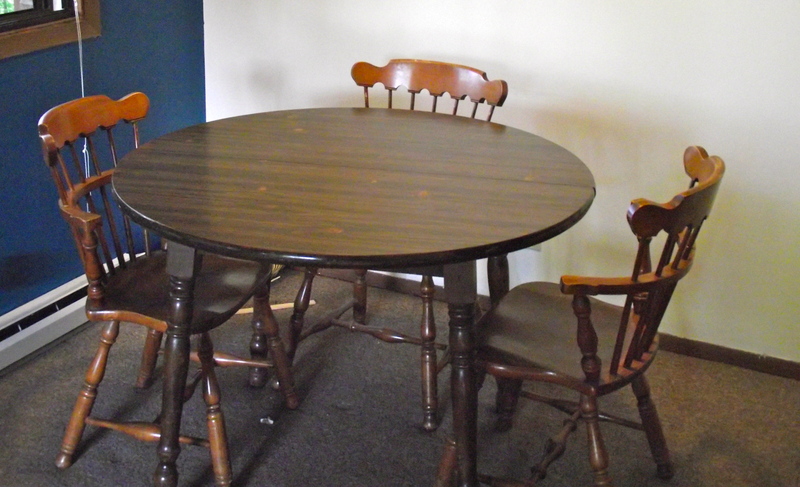 One of our most recent additions was our set of dining room chairs. When we were faced with an unknown number of moves in our first year of marriage, we sprang for some awesome plastic folding chairs. Needless to say, those were getting old. SO, I hunted for months and finally found these puppies at Goodwill. I wasn’t the biggest fan of the color, but at $3/each, I couldn’t pass them up. Then, I had a wonderful idea: ART could happen to them. I love browsing around home decorating and other artsy blogs, and was obsessed with the idea of colored dining room chairs. Obsessed. 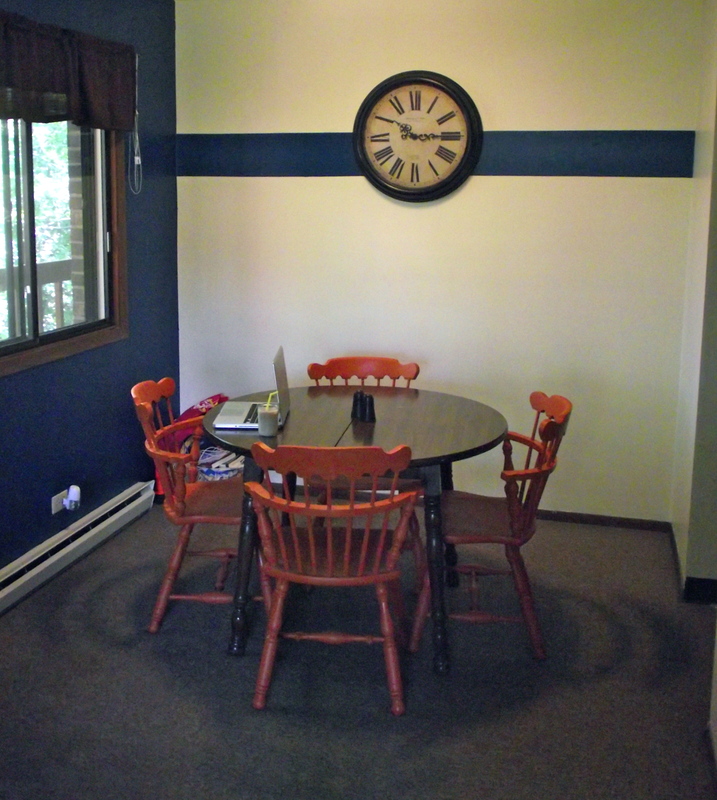 If there is a picture of your colored dining room chairs on the internet, I have seen it. Someday, we’re going to have to grow up and buy sensible furniture (maybe), but today is not that day. 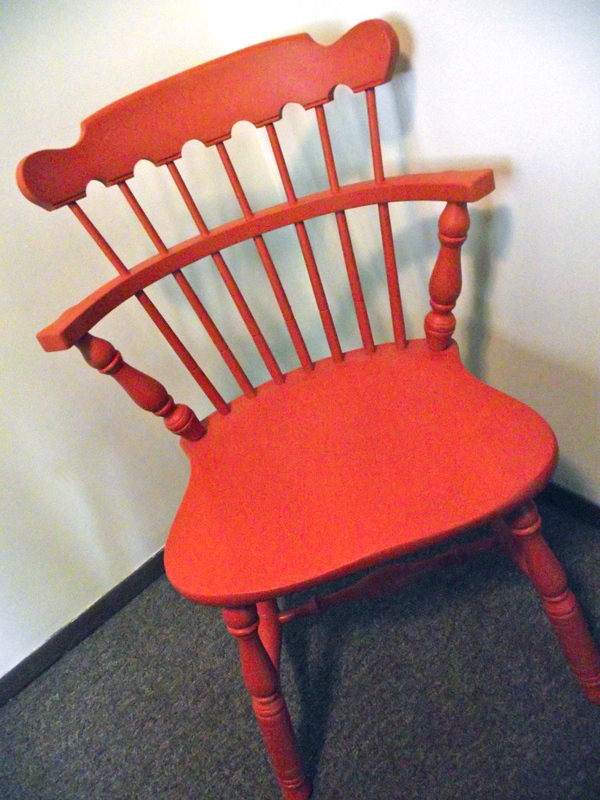 Today is the day for orange dining room chairs! David wasn’t sure about my idea, but he trusted me, and now, we have a very happy dining room. As with most DIY projects, it seemed a lot easier than it actually was, but it was definitely worth the work. What’s that? You’re also obsessed with colored dining room chairs? Well, today is your lucky day, I’ll share my wisdom with you. Once you gather all your supplies, it’s finally time to begin! Sanding. This could also be called the boring part. The really boring part. Just keep reminding yourself that soon, you’ll get to paint. Also, don’t forget one of those masks that my handsome husband is modeling. You don’t want to be breathing in all that dust. 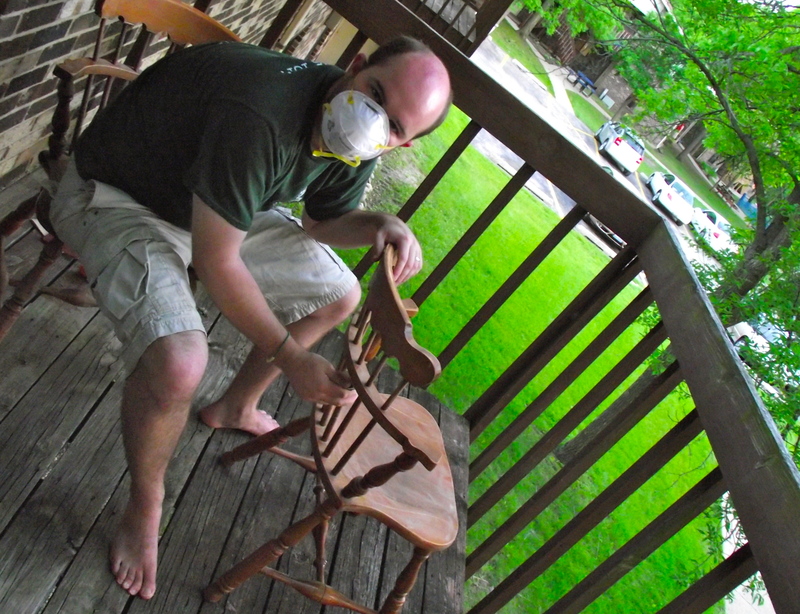 If you’re just painting the chairs, you don’t need to sand too intensely. You just want to rough the surface up so that it takes the paint well. If you’re planning on staining them, I take my hat off to you and suggest you head to another blog. There will be no staining going on here. ever. 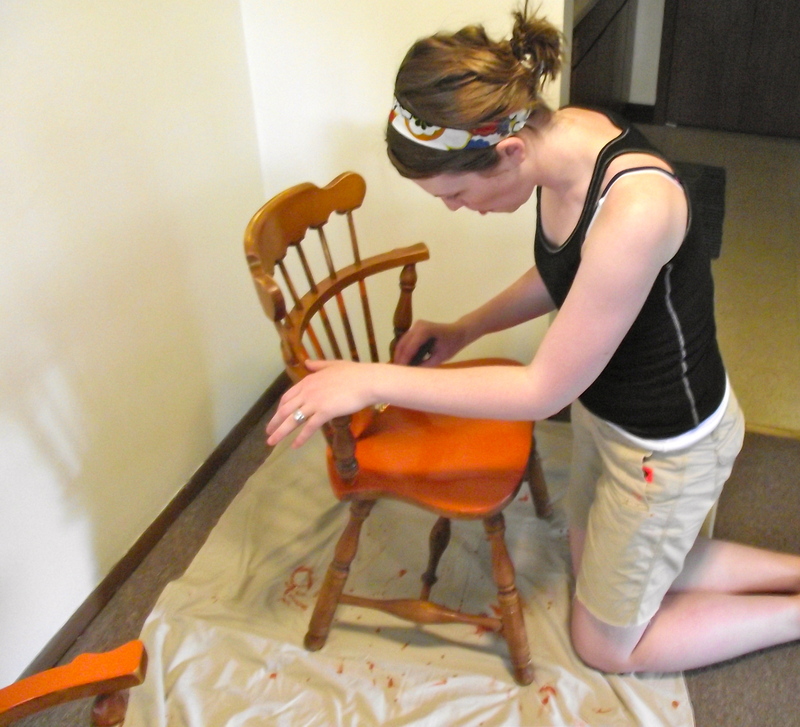 Once the chair’s all nice and rough, you can go ahead and add your first coat of paint. If you happen to be painting your chairs orange and they look a little like macaroni and cheese while you’re painting them, take heart. The paint dries darker. Some people suggested using a roller to paint the chair. I tried it on the seat of one, and preferred the look of the paintbrush, but play around with it and see what you like. After you paint them once, and let ’em dry, you’ll want to add a second coat of paint. Tedious, I know, but definitely well worth it. You can't really tell, but they ended up being a nice burnt orange color. Finally, after you have allowed the paint to dry for several days, go ahead and spray ’em with the sealant. This’ll help ensure that your dinner guests don’t end up with stains from your chair all over their clothes. Thankfully, the sealant dries very quickly, so you’ll be able to enjoy them very shortly after you seal them. And, Voila. All of the sudden, your dining room looks 100% more awesome. And, you made art. We love the color they add to our home. What are your thoughts on colored dining room chairs? Would you ever do it? I’ve heard of some people buying a variety of mismatched chairs and painting them, too. I’m not patient enough to come up with a collection of chairs, but I think that a variety all painted the same color (or even different colors) could look fabulous. Be warned, though. Once you attack one thing in your house, DIY has the tendency to take over your life. Love it! Can’t wait to see them in the fall. Sinto saudades de voces…Love you! Love the color!!!!!!!!! I would love to try that when I get my own home!!!!!!!!!!!!!!!! !